Our awareness campaigns are designed to inspire action through raising awareness about critical issues that effect marine mammals and their ocean home. Help feed a seal! 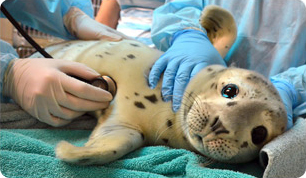 Each year we need to raise up to $100,000 to feed our seal and sea lion patients. It costs just $1 for 1 lb of fish - join our Dollar-a-Pound challenge today! The Marine Mammal Center is generously sponsored by Proctor & Gamble's Dawn dish soap! Learn more about the Dawn Saves Wildlife campaign! Find out what to do when you see a harbor or elephant seal pup alone on a beach: it can mean the difference between life and death for newborn pups. Educate people about the harmful effects of our everyday trash on marine life and encourage people to take a pledge to STOP TRASHING OUR OCEANS! The Marine Mammal Center is a Conservation Outreach Partner with the Monterey Bay Aquarium's Seafood Watch Program. Learn more about what it means to be sustainable and how you can you help! As the world’s climate undergoes significant changes, The Marine Mammal Center is focusing on actions to ensure a healthy ocean for marine mammals in the coming years. We depend on the oceans for our survival regardless of where we live or what we eat. After all, the ocean generates most of our oxygen, regulates our climate, and directly provide a critical food source for much of our population. We cannot survive if our oceans do not survive and thrive too. Because our work is on the frontline, we see first-hand the impact human interference has on the survival issues that marine mammals face, and we listen to their messages about their health and the health of the ocean. Sharing this information with you is an important part of our mission. To stay informed about our campaigns, sign up for our e-mail updates.